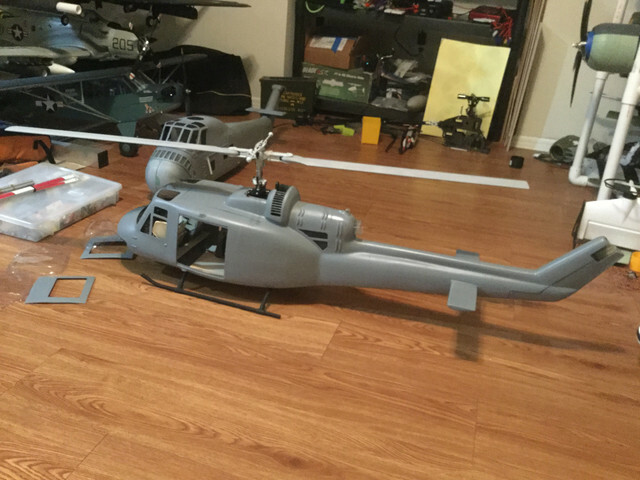 After several months of waiting, I just received my 500 UH-1C Fuselage from PKM, so its time to get started. 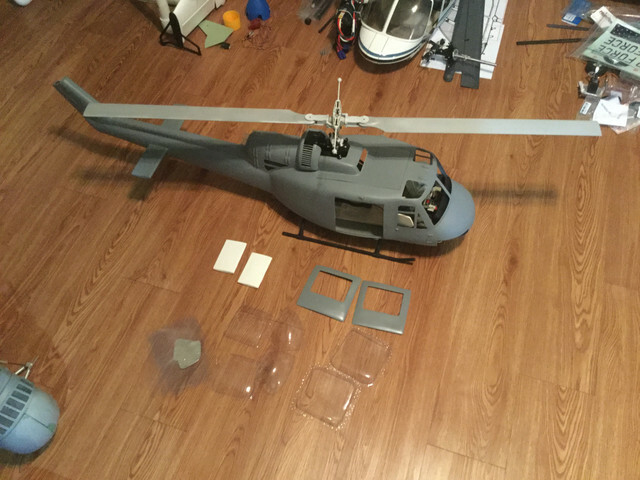 I already had a few of the parts waiting at the ready, including a microhelis scale head, and some zeal 500mm blades modified with the Huey's signature squared off blade tips. 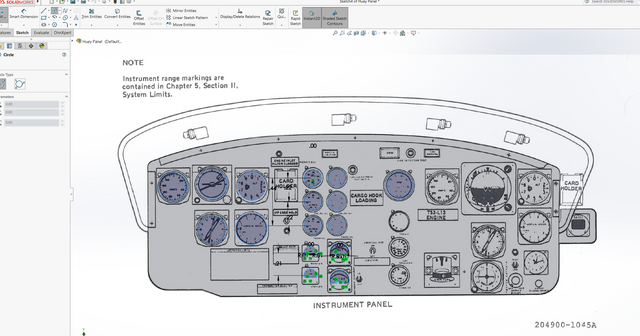 The cockpit and pilot shown were purchased from another forum, and are a perfect fit in the airframe. Overall first impressions of the airframe are very good, surface detail is great, but lacking in a few key areas. The door sliding tracks, steps, and fuel caps are not present, and will have to be added later. Stay tuned for more progress..
Hi there..can I know where u get that scale body? Thanks guys, it going to be fun project! Hi there, it is a custom built fuselage from PKM (Phuket Hobby Model). Best way to get in contact with them is through email at phukethobbymodel@gmail.com. Did you do the scale rivets? or did it come that way? It came that way, was one of the finish options when I got it. 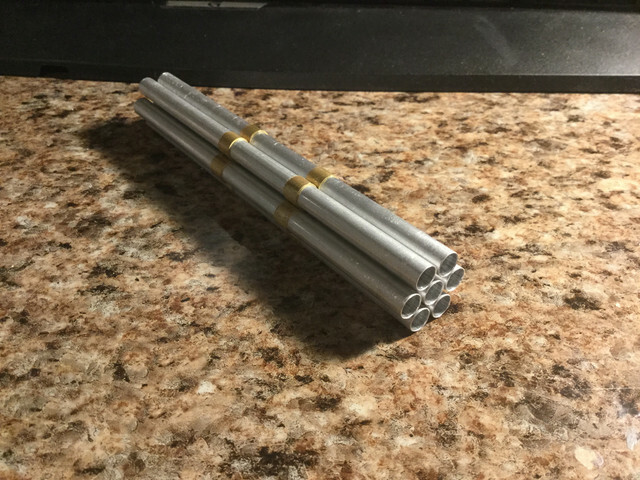 Still missing some major features on the surface finish, but since I’ll be putting the doors in the open position, it shouldn’t be too much of an issue. Spent the last couple days getting things set up on the mechanics. The frame is an HK-500TT with all gears and such have been replaced with Trex 500 ESP parts and I'm using a Roban raised tail gearbox. Target headspeed will be around 1800, and will play around with different pinions depending on tail authority. Should have plenty of lifting power at lower speeds with the 500mm blades so long as the tail cooperates. 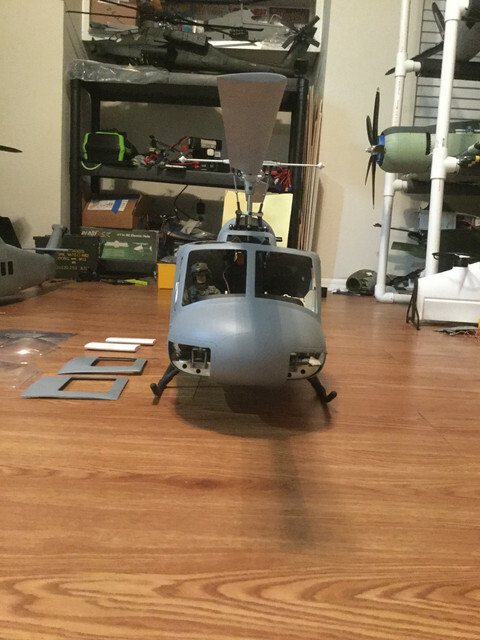 I believe it is the same as the heli artist version, here’s a photo. Oh Yeah they did it!!! makes my day. Thank you. 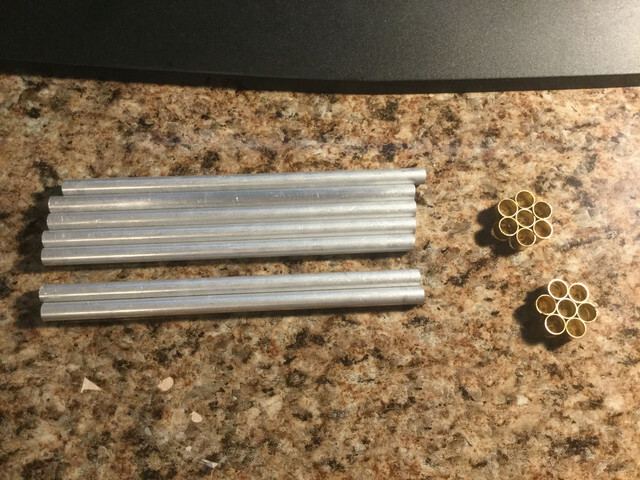 Haven’t had much time to work on this, but I’ve started on the basics. Glued in a 1/4” plywood base over the gear mounts, with will serve as the mounting point for the mechanics. Also finished installing all the servos and electronics within the mechanics. Tonight, I installed a Freewing light controller and some of the LEDs from the 90mm F-16, and they are super bright! Still have to install white lights on either side of the tailcone, and the beacon above the engine. Nice. I have a turnigy lighting system to put in mine. 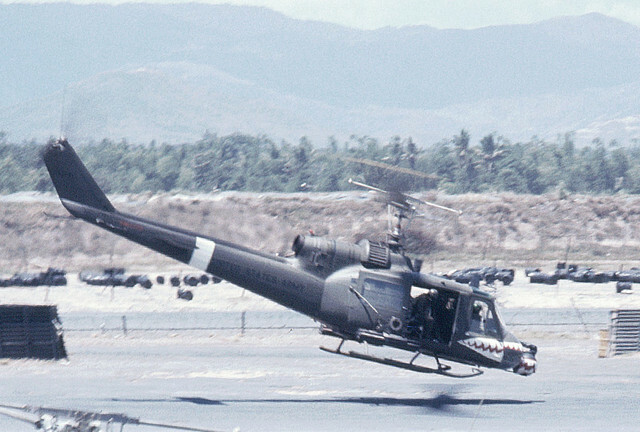 Looking forward to seeing it John, your last UH-1B was beautiful! 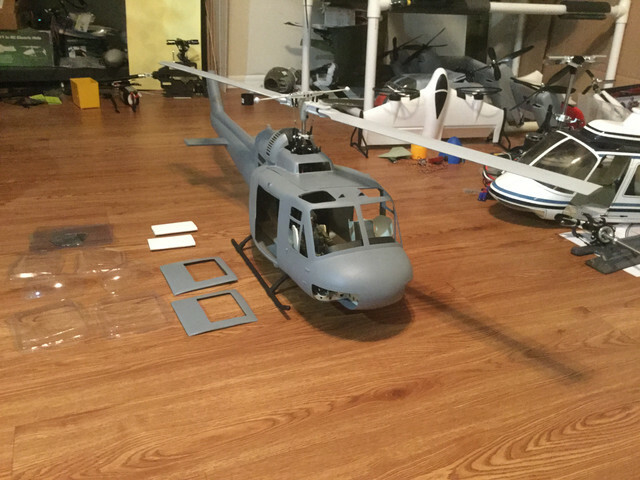 Made some more progress on the Huey today. Installed the roof antennas and pitot probe, completed rivet work in a few missing spots (mostly the entire underside). After some primer to seal over the rivets, I couldn't resist shooting some OD on, and painting the glade shield on the nose. 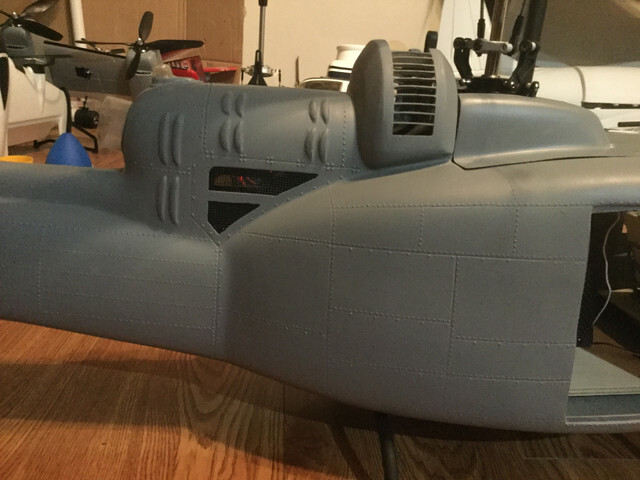 Still have to work on a few more airframe details before continuing paint, but its starting to get there. 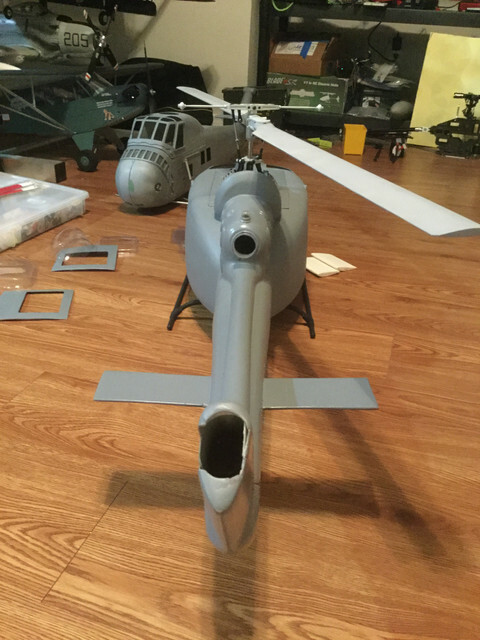 I need to install the "towel rack" VHF antennas on the tail, add the tail stinger, and am considering a rework on the H-stabs. The manufacturer appears to have put B model sized stabs on, and they aren't perfectly aligned. The C had a much larger chord than the B, so I might try extending them with balsa and FG. Also looking at adding the cargo hook on the bottom, it's too prominent of a feature for me to omit from the airframe. Another fine bit of workmanship there, Delta. She's lookin' good! Thanks Prowler! Hoping to have something flyable by Helis Over Apache Pass in 2 weeks. After a full day of work, the mechanics have been set up, programmed, hovered, and installed in the airframe. Also installed the tail position lights and flashing beacon. Still have solve a few issues, but maiden flight should be soon! Then I will be working on getting the paint work finished up, and doors/windshields mounted.